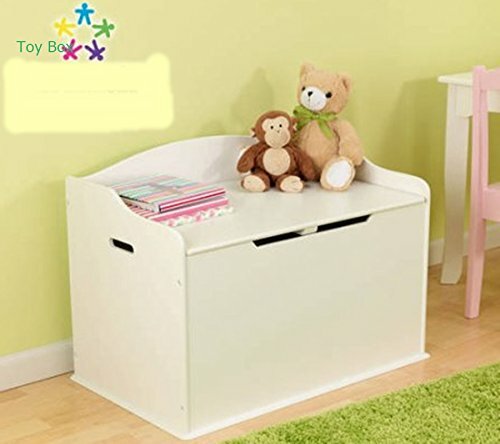 With the Toy Box in your child's room, you will never find toys scattered here and there. This wooden toy chest is big and spacious to accommodate just about any toy. Available in a rich color, this wooden toy chest looks attractive and is a great functional addition to your child's room. It has a safety hinge on the lid that does not let the lid to slam, and it is safe for a child to use. It is easy to open and close, and your kid can keep all his toys in one convenient place. This toy storage bench has spacious top surface that can double up as a seat for your little one too. It is sturdy and durable enough to withstand handling by kids. With this wooden toy chest, your little one's room will be tidy and organized all the time. The two hinges are soft close so it does not slam shut. The top offers space to sit or place things on. It holds more than it looks like it would. Not too heavy to move for cleaning but very sturdy. Our customers receive a free bonus e-book with tips for better life.